I'm not sure what it is, but Jeremy and I are both wiped out from this week. Jeremy certainly did have a stressful week, lots of late night calls to the US, but overall, the kids were well, and I didn't have that much to do. Perhaps I'm a little tired because Jeremy is tired. Who knows. I haven't written much, because there isn't much to say, past the laundry, dirty dishes and such things, but here are the highlights of the past few days. On Wed night, I had my 2nd piano lesson. I'm trying really hard to keep the rythmn. It's not something that comes naturally to me, so I have the metronome cranked up and really, really slow and I'm trying to play a Sonatina to the metronome. Pretty much as soon as my concentration wavers, I lose the beat. Oh well, my teacher says that I should be able to learn it. I also signed up for private theory classes, so hopefully I'll learn that as well. Thursday, we went out with Kate and her aunt Mary Ann. Kate has had a bunch of people visit her here, I'm impressed. We went to the Carl's Jr. downtown to get a real burger, which I haven't had in a long time. I watched with amazement as Kate ate 2 burgers! Remember, she's 7 months pregnant and growing. After lunch, Vince found the Toys R Us and was enthralled. I've been looking for this CD called the Hi-5, it's the soundtrack to a popular kids show here. I couldn't find it in the local mall here, but near the Toys R Us, there was a Tower Records and they didn't have it either. They sell it on Amazon for 11 dollars. Today there was a really loud thunderstorm. I have never seen Ruby so scared - she was trembling. She couldn't decide if she wanted to be near me or in her crate hiding. So after each clap of thunder, she would either slink off to her crate or come find me in the apartment and tremble at my feet. Vince slept through the whole thing and Edda was fine about the storm. 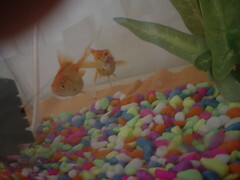 Our fish, photo taken by Vince. 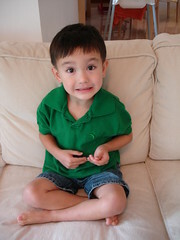 Another picture of cousin Felix. So I started a project last week. A baby sweater which turns out will fit Edda perfectly, but who the heck wears sweaters in Singapore? Anyways here is the back of the sweater... I'm working on the front. Hopefully I can finish this up soon. We don't have a TV so in order to entertain ourselves, we take baths. Sometimes up to 4 times a day. Here's Edda in a glamourous pose. Jeremy is busy, busy, busy. Today we tried to make fake play-dough. Instead of it being called play-dough, it's called salt-dough. I didn't use table salt, I used salt that was a bit coarser grind and I think that was a mistake as my mixture didn't really turn out that well. It turned into a sticky lump. Not satisfactory. We spent the weekend at home. Edda had a cold, so we didn't really go anywhere, except on Sunday, we went downtown to our favorite department store Takashimaya and just window shopped for an hour or so. I also worked on our family portrait. I'm determined to send out Christmas cards this year, we'll see what happens. Jeremy's work is going gangbusters now. Lots of excitement and lots to do, he's enjoying it quite a bit. Which is great. The kids and I had a quiet day. I don't know what happened, but the past week, the apartment has exploded into a pile of laundry and dirty dishes. Always more to do. Edda is a bit sick today, must have picked up a bug at the water park yesterday. She stayed up a lot of the night last night and as soon as the sun rose, she seemed fine. I had planned to go to a seminar on wellness with a friend this afternoon and Jeremy encouraged me to go as Edda seemed good during the morning, but as soon as I got to the place, he called and said that Edda wanted me, so I said goodbye to my friend and hailed a taxi home. We moved the furniture around a little bit today. No pictures today. Just a wonderful afternoon playing the water at Singapore's largest water park. We went with Mathilda and Julia and crossed the whole island. Vince had a blast! Thank you Katherine for mailing Vince's name puzzle. He was *so* excited to get it and he knows all the letters of his name now. Thanks, mom and dad, for all the wonderful clothes! The kids really needed them and Vince has already worn all the shirts you gave him today. He loves to take on and off clothes. We needed to pick them up from the post office, we all walked to the post office together to pick it up. Today was a quiet day, it rained all day. So we stayed mostly inside. Getting my Brad Pitt fix. We also enjoyed the celeb magazine, all of us spent at least part of the evening leafing through this great American magazine. Thank you Karin! 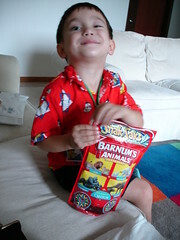 Thanks for sending the treats in the mail, Vince dove into the animal crackers. 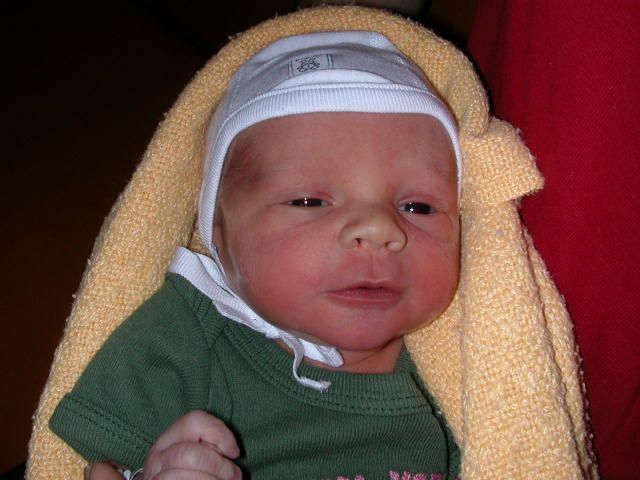 Rukia and Edda and Ben is a father! 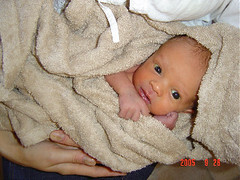 OK, the big news first... Ben called this morning and told us that his son was born on the 20th of Sept, right before midnight. Johanna and the baby (still nameless) are doing well after a long labor and finally a c-section. So happy and glad to add another young member to the family. Vince was sick a lot of today, runny nose, sneezing and a low grade fever. Not bad, not great either. Took some decongestant and Tylenol. We went out today while Rukia cleaned our house. 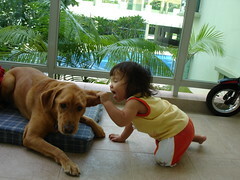 Here is a photo of Rukia and Edda. I started my piano lessons today. 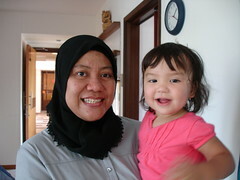 This is the first time that my piano teacher is younger than me, she's 20! Anyways, she is going to help me get the rythmn. Finally a teacher who will help me keep time with a metronome! I always thought I have had trouble keeping time in my music. I'm also going to work on having even consistent notes. So my first assignement is from the dreaded Hanon book, working on keeping time and the notes all the same. It'll be a challenge. Also, I'm going to start taking theory classes as well. It seemed a bit hectic also. There was some confusion about when they were saying the vows and the speech. Pei-sun ended up losing her vows right before the ceremony and we had to delay like 15 while we tried to reprint them. In the end, we just wrote them over again. It wasn't terribly complicated since she had written something almost exactly like Choon's vows. There was good food as usual at Choon's. He had another malaysian friend cook a Salad of potatoes, and had ordered 1 thing from various restuarants. Seafood soup from a peruvian place. mutter paneer from shalimar. some chicken and beef kabobs from this afghan place. All the meat was halal for all the Karims who came to the wedding. Arif and his new wife Tahera are funny. They were absolutely tearing up the dance floor! very very cute. plus the Redskins win in Dallas! Went to a craft store, Spotlight, with Julia and Mathilda. Here's Vince and Mathilda trying out the various goods in the store. Man, they were out of control today. My computer is dead. The HP people called and told me that I should just forget about it. It's too old to fix. Oh well. I told Jeremy that I didn't need a computer anymore - that since I had gone two months without a computer and hadn't gone crazy myself, why do we need to go out and buy one? Then Jeremy reminded me that he has a job because people go out and buy computers, so maybe we should too. So OK. I'm going to go out and buy a computer. I think. I'm still thinking about it. OK while I'm thinking about it, Jeremy is going to buy one for me. I think it's going to have an AMD chip. I think that we have only 4 computers to pick from anyways, it shouldn't be that hard. I think we might have to go the whole nine yards and buy a new printer! Yikes! What will I do with all this new gear. I might have to enter the new millenium. 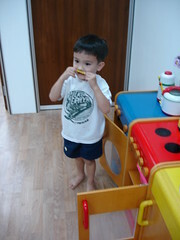 Today we registered for Appletree Nursery school. 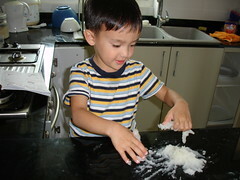 Here's Vince playing with their kitchen set-up while I'm signing him up for class next year. So in November, there is going to be orientation and then in January classes start. I think it will be OK. I can't believe it's going to be months before he starts school. Look at my new green shirt. My poor Vincie. The very first thing he said to me today was, "I have no friends." And then in response to this statement, I said the most ridiculious thing and told him that Edda and I were his friends. AS IF that would help him out at all, as if that would help him out of his problem. He immediately replied, "I have no school friends." which made my heart break right into the bowl of oatmeal I was feeding Edda. Then he crawled into my lap and curled himself up into a ball and stayed there for a while. So today we looked at a school called Appletree. It's close to home, a 6 minute walk through the mall and they have classes 3 hours a day M-F and the classes start in January. We met Ms. Wendy and got an application form. So we'll fill it our and sign up for it. If something better comes up sooner, we'll do that instead. But at least we have a plan. 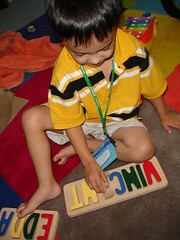 Vince was clear he didn't want to eat lunch or take a nap at school and at the Appletree he won't have to. God, I hope we all find friends soon. Another palm tree - no wait, it's the harvest moon! This weekend, as I walked Ruby in the evening after the kids went to bed, the park was filled with families celebrating Mid-Autumn Festival aka The Lantern Festival. The trees in the park were filled with paper lanterns glowing from inside with lit candles. You are suppose to take a box of candles and stick them to the concrete ground with a dab of melted wax. You should light all the candles that you have and then you light sparklers with the lit candles on the ground. Some kids go crazy and start trying to light 10 sparklers at once and then throwing them into an empty grassy area. I took a photo of the full moon overlooking our apartment complex. It was a quiet day here at the Martin/Lee household. Vince was just bouncing off the walls. I think he got a sugar high from this grape drink that he loves, Ribena. Just yelling and screaming and having a lot of fun and just sucking the life out of me and Jeremy. So tomorrow is Choon's wedding. Today is prep day. rehersal and all that. I wrote my officiant's speech this morning at about 11. ha. hopefully it'll go well. i still need to pracdtice out lout. laff. Testing. Testing. Testing. Testing. Testing. Testing. Testing. Testing.Testing. Testing. Testing. Testing.Testing. Testing. Testing. Testing.Testing. Testing. Testing. Testing.Testing. Testing. Testing. Testing.Testing. Testing. Testing. Testing.Testing. Testing. Testing. Testing.Testing. Testing. Testing. Testing.Testing. Testing. Testing. Testing.Testing. Testing. Testing. Testing.Testing. Testing. Testing. Testing.Testing. Testing. Testing. Testing.Testing. Testing. Testing. Testing.Testing. Testing. Testing. Testing.Testing. Testing. Testing. Testing.Testing. Testing. Testing. Testing.Testing. Testing. Testing. Testing. 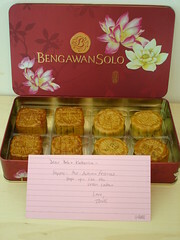 Virtual mooncakes, with double yolks! Hello Noel and Rena. 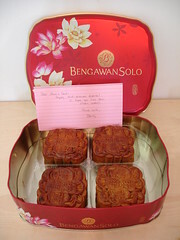 We bought you these mooncakes a few weeks ago, but apparently they are a danger to homeland security, and we could not send them. I hope you like them via the internet. If you zoom in (by clicking on the picture) you can read the note from Doris. My monthly grumpiness has settled into the house causing everyone else to be also pretty grumpy. Vince has been especially demanding this past week, just full of unspent energy and interminable questions that never stop coming. Edda has been struggling with walking and balancing and oftentimes ends up with a leg wedged uncomfortably under the rest of her body or she smacks her head into the marble floor, both resulting in wailing and crying. Today we went to the pediatrician near our house to make sure the kids vaccinations were up to date and also to get vaccination recommendations for our trip to India this winter. This is the first shot Vince got that he was fully aware of what was happening and he screamed his head off, but got a gumdrop and a lollipop in return. Edda only screamed when the needle was actually in her leg, otherwise she was fine. She got 2 gumdrops, one for each shot. The doc seemed unconcerned about the walking and said to just give it more time which is what we thought anyways, although she is getting quite heavy to carry around. We also went to the Singapore DMV to sign up for a driving test. We only have to take the written test to get a Singapore driver's license, but they have a pretty high fail rate, I think you have to get 90 or 95 percent correct to pass. Anyways, the earliest test date is at the end of next month, so we have a month to study. Our friend, Agnes, came over because she heard from Jeremy that I've been homesick and grumpy, she's so sweet, she brought Vince those ice treats with red beans and weird toppings and lanterns and also this dragon lantern with batteries that lights up and the eyes blink and the ears twitch and Vince ran away from that lantern screaming his head off. I also signed up for piano lessons which start on Wed evening. My teacher is Miss Chua. We will see how it is. We went there before the pediatrician's office opened and there are a million little rooms with upright pianos and little tiny kids playing Old McDonald had a farm and such things. Hopefully I will like my teacher. Poor Ruby, she gets attacked regularly by Edda, otherwise known as Jaws. Here we are on the balcony of our apartment and Edda goes in for the kill. I actually stopped her before she was able to nip Ruby, but shortly afterward, I wasn't paying attention and Edda must have bitten Ruby's tail and I heard a yelp from the Rubister who turned and glared at Edda. Edda just doesn't get that we don't like to be bitten! We got our wonderful digital non-metric scale yesterday in our sea shipment and weighed all of us and it turns out that Ruby isn't as fat as we believed. She's 60 pounds, up from 58 when we left New York. To celebrate that, tonight we made Lion's Head meatballs and gave Ruby 1/2 of one. It reminded her of the delicious Lion's Head meatball my mother made for her when she was a pup in Austin. 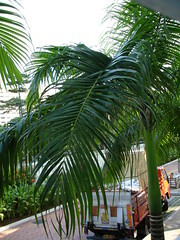 I know this picture looks like a palm tree, but if you look more closely, you can see the truck that is parked behind the frond... We got our sea shipment today, which means all our winter coats came today. Hooray! OK, even the movers were laughing at the winter coats, but I figure that we might be visiting Sweden from Singapore and I'd like to be prepared. But more importantly, I want to start taking piano lessons again and start rowing again on the rower that came today. Jeremy accidentally fried my CPU by plugging it in before he switched the switch on the switchable power supply. We heard a loud POP! and smoke came out of the computer. I think I'll still be without a computer for at least another week while we get the trusty old AMD computer a kick in the rear end. Oh well. I have the sweetest family - everybody wishing me a happy birthday from all over the world. Jeremy gave me the nicest birthday present ever - this nice digital camera that I'm using to share pictures with all the readers of this blog. Also, he came home early, which was also a really nice present because I'm a little bit homesick these days. Perhaps it's because I realized that I haven't celebrated my birthday in the same place 2 years running for many, many years now. 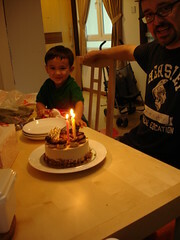 We went out to eat and brought home a birthday cake, which is just a cylinder of mocha whipped cream. Annie is so sweet and invited our family to join her friends in the evening for a little little lantern parade in our apartment complex. They even provided a lantern for us, complete with little burning candle inside and also sparklers. 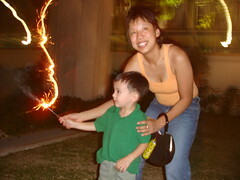 It is a little freaky seeing 3-5 year olds with sparklers and a million candles around, but it was a lot of fun. Vince was a little bit scared at first, but got excited about it towards the end. Also, these night time celebrations are hard for him because he is so exhausted. I think today he got up at 6:30 in the morning and didn't take a nap and didn't eat anything except sugar since about 4 pm. Back to WA this weekend. This is my friend Kate, whose husband works for AMD with Jeremy. They moved from Austin, TX to Singapore pretty much the same time we did. Kate is pregnant and the baby girl is due in December. She came by in the afternoon and we chatted and had a nice time together. 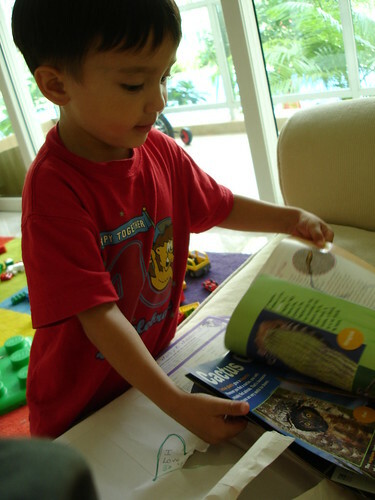 Edda was able to take a nap during her visit and Vince showed off his Bright Horizons craft book. Vince was facinated by her blue skirt which had beautiful beads sewn into the fabric and he kept wanting to touch and rub them. After a while, I had to make him stop because it was getting a little bit redundant. 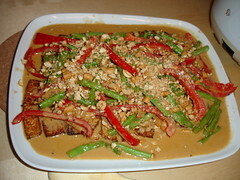 Tofu with green bean, red pepper, and cashews. I'm up for no good reason. Installing Windows XP on my desktop. I should be sleeping or like doing work or working on my speech for this weekend. I had a good phone chat with Doris tonight. and I had a pretty good conversation with Vince. Looks like he's a vanilla man. But choco crossaints are good for him too. I have one of those almost every morning at the moonbeans cafe across the street from the library. too bad it's $2 a pop. I think Vince said he was going to ride with me on his new bike at some point too. Tho i could be mistaken about that. It's very simple. Ask yourself what do you want to say? Then condense it down into one sentence. Refine that sentence over and over again until it is perfect. Then read the sentence out loud. For my secret pal 6 buddy. I am a novice knitter, I have only 2 pairs of straight needles and one set of circular and about 10 skeins of yarn. My mother is a really good knitter and I want to be able to someday knit as well as she does - when I was young, she made all our winter sweaters that we wore all the time. 1. Are you a yarn snob (do you prefer higher quality and/or natural fibers)? Do you avoid Red Heart and Lion Brand? Or is it all the same to you? About a year ago, I started knitting, I bought all my knitting supplies from Walmart and I started learning increases, decreases, ribbing, etc. Then I got discouraged after my toddler son got into the Red Heart yarn and tangled it all up and although I was doing well with my self-education, I threw it all away. Now, I've vowed to get at nice knitting needles and nice yarn to support my local yarn store and I have to say, the nice bamboo needles and nicer yarn just feel good. No, but I'm especially interested in crochet. Nope. Although I don't like perfume or smoke. On and off for about a year. I do enjoy chocolate. Yum. I also do like hard candies and mint. Oh, I also like soft candies like Mentos and gummies. And I like salty things like nuts and DORITOS. Love all colors, except flourescent colors. Um, to knit a fishermans sweater and live somewhere where I can actually wear it. Ah, I really want to become a master knitter through the Knitting Guild of America. I like little things I can finish quickly without a lot of yarn, that way I can concentrate. A sweater or a full sized afgan seems so big. Nothing, I'm looking around for a pattern for a nice felted bag. No, but I want to be. 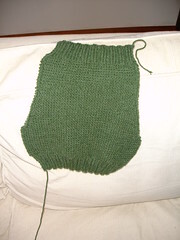 Through the Learn to Knit program with the Knitting Guild of America. I like the Tazmanian Devil and I like dogs and cats. 28. Any books out there you are dying to get your hands on? 29. Any patterns you have been coveting, but haven't bought for one reason or another?? 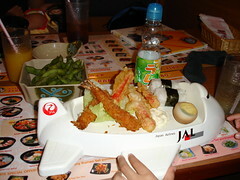 Kids meal at the Ramen place, served on an airplane shaped plate. OK, so there is nothing really wrong with the Fair Price near our house. Fair Price is the main supermarket here in Singapore with branches located everywhere. I bet you could walk all day in 15 minute intervals and just rest at a different Fair Price each time. I like to shop at the Cold Storage which is a few MRT stops over from our house, with wide isles and shorter lines and more stuff like cheese and tortillas. However, we end up shopping at the Fair Price pretty often. You can see - first, my new haircut and second the stack of Tiger beer behind me. And next to the Tiger beer and on the floor is a bunch of boxes. 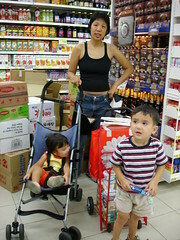 Basically, they are always, always, always stocking the shelves and it is such a pain to move the stroller, keep track of Vince and push our little grocery cart around. Also, since it's always packed, I think they run out of stock pretty quickly and so you will find different things on different days. One day, the didn't even have Kikkoman Soy Sauce. What's with that? Shaving, shaving over the ocean blue. Jeremy finally got a hair clipper yesterday and got around to trimming his beard today. Vince and I hung around to watch those long, long whiskers go down the drain. 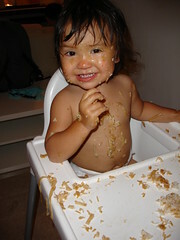 Edda was in the bathroom as well clutching the edge of the bathtub. This weekend, make up time on Saturday. Stay Put on Sunday. Just relaxing. Presenting my self in front of people properly is always a challenging job for me, especially in front of loved ones. Without presenting oneself properly, in most instances, exchanging inner thoughts and ideas is indeed very difficult and rare. This really bothers. I don’t know why, but it has been with me for a long, long time, just too long one may say. As time goes by, this bothering thought is on the precipitous rise rather than falling steadily. With this thought constantly haunting me, I have experienced a lot of uneasy moments alone and sleepless nights, going over this, analyzing, and trying to uncover culprits, but so far, without any heartwarming tale to tell. Sometimes, of course, I blamed myself on almost every thing; sometime I blamed things that I could think of; but mostly with emptiness, I had nothing tangible to lay blame on, just watching my flaw running deep, deep and deeper into ravenous ravine hopelessly. Maybe, there is no culprit at all. But it is just all coded into my “Genes” and, therefore, it is predestined to prevail, regardless of one’s preferences. Naturally, I hope not. Look at these perfect dumplings. Filled with the most delicious pork which when steam, oozes the perfect amount of water and fat and yummy goodness to make the most delicious broth that burns your tongue when you bite into them. 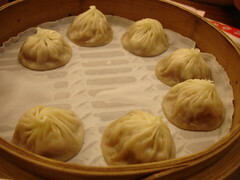 We went to Din Tai Fung which is a Taiwan dumpling place that has a few branches here in Singapore. In Taiwan, if you didn't show up right at 11 am for lunch, the wait was an hour at least. Today we walked in and sat right down. Vince always manages to make friends on the subway. 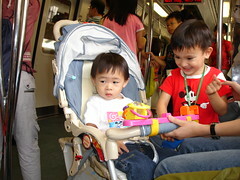 Here he is furiously playing with a toy cell phone attached to this little boy's stroller. We never got his name even though his mother was constantly nagging him to say hello and to introduce himself. 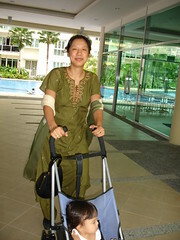 Last night, during my outing to Little India, I bought an outfit which I wore all day today. Isn't it lovely? Yesterday, I went out with Julia and Kate to Little India and had a wonderful time. 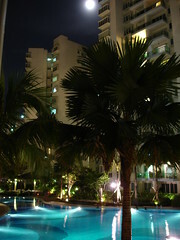 It's so nice being outside at night in Singapore, so cool and breezy. Little India is busy at night, they have a 24 hour department store called Mustafa and Dakshi tells me that you can buy anything there except for an elephant and a Mercedes. It's nice to hang out with women, it's been a long time since I have done such a thing. We ate at an Indian buffet and walked and walked all around. 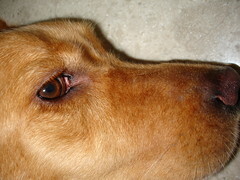 I didn't take any pictures of the evening, so a close-up of Ruby will have to suffice for today. Thanksgiving is in the conner. We are going to have day off and the Friday is not a working day if we still have job. If not, we can come to Sigapur or China to meet you all. Doanld, what do you think? Let me know too. We have been in Denver for a month. It is a nice place. Office is only mile away from the studio. We are working on a project to build a plant convert the weapon grade polonium into a fuel rode for nuclear power plants use to generate electricity. The French has one of such plant and we are going to build two. One is located in SC and the other one is in Russia. Since we are use French design, some documents are written in French. I have to learn how to read French. I told my lead that there is no problem to learn French since I learn English by reading technical stuff. As a mater of fact, I use the equation to understand the French. I have to spend lots of time to understand French if there are no mathematical equations. So I listed a spread sheet to have French and English for my reference. It helped a lot since my memories are not like 40 years ago. 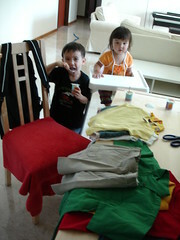 In the office, there are most temporary engineers to do the works. In our section, there are 6 engineers, 5 are temporary. One of them has been here for more than year. There is another old guy (may be ~ 70 years old) in next section. Two weeks ago, few engineers had business trip to SC. They could not find him in the Atlanta airport. Later, the airport security people found him. 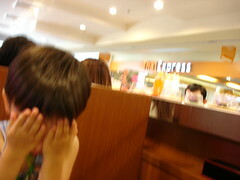 He disoriented due to his low sugar level and fall down in the airport. They sent him back to Denver hospital had quite few stitches and he is back to work yesterday. He looks OK. But, he said that he has some problem with his legs. It is very sad that he has to work at that age. 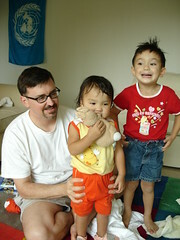 Daddy and I worked very hard when we were young and we do not have to work at old ages. When getting old, the health is getting bad to worse. That is why there is a retirement and social security system. Our boss is very nice and most time is hand off. He knows that we can help him to do the job since he is a MIT graduate and knows very well in the field. It is nice to have a boss knows technically. We are staying in a very small studio with two cooking tops and a small refrigerator. I still can manage to do some cooking during weekdays. We had dumplings too. Daddy now helps to wash dishes every time we have supper at studio. We also found a nice swimming pool just like Rockville’s about 6 miles away. We go swimming twice a week. One of co-worker told us that here is cheap movie theater. The cost is $1.00/ticket. It is only $0.50/ticket on Thursday. We have found the place and going to watch a movie this week. Our medical insurance is covered by COBRA. The premium is about $750/mo which is much higher. The good thing is that we will be 65 next year so we have to spend about $10,000 total. Not that bad if we have job. Next long weekend (every other Friday is off day); we are going to Washougal, WA on 9/15/05 and come back to Denver on 9/18/05. We are going to take our friends couple out for nice dinner since they helped me lot in moving out of the Richland. It was nice I made Bechtel to pay the moving. Moving is a big hassle. Doris knows it all well. But it is much nicer let company to do it. They packed everything and moved back to Maryland. My friend Mrs. Ling helped me to open the door for mover to move all stuffs into the basement. Daddy went back to Maryland few weeks ago and took a quick look at the stuff and opened few boxes and found everything is in good order. We moved our desk top computer ourselves to Denver. Our place is too small for printer and scanner. So we only unpacked the computer, monitor and keyboard. There is no place to put a chair in front of the screen and I only use the computer for few minutes. Last weekend, Daddy drove 1700 miles to National parks. We went to dinosaur National park in CO first. But they do not have any dinosaur bones. So we went to UT to see the dinosaur bones in the stone. They built a building to cover the part of the mountain where the dinosaur bones are located. It is very nice place. We would like to take Vince and Adda to see this place later on. I like Zion National park most. Daddy went both Zion and Bryce national park before when he was in Los Vegas. But he did not take shuttle to see the best part of those places. In Zion, we saw two climbers on the vertical cliff. They slept against the wall vertically that night to rest. It can not climb into the top by one day. The tour guide told us that the sand rocks are difficult to climb. But it is very safe to climb since every climber knows what they are doing. However, the day before, there was an accident for a hiker. He was off the trail and fall into the bottom of the cliff. Of course, he did not survive. It is very sad. I picked up three big rocks. One is from the Rocky mountain, other is from the Green River at dinosaur place and third one is from Zion. They are in different colors: Grey, Red, and black. We took lots of pictures but I did not take the cable with me and daddy did not find the cable from packed boxed. We went Wal-Mart and dumped all pictures on a CD. Hope I can mail you some tonight. A low-key day today for me and the kids, we spent the day going to the library, eating at McDonalds and Vince taking a nap (Yes!). For about 45 minutes today, both of the kids were napping and I had a few moments to myself, which I spent asleep. Vince really dislikes taking a nap and I don't often force the issue, but I felt today that he really needed one and he went to sleep after about an hour of "I DON'T WANT TO TAKE A NAP!" But if he takes a nap, then we can go swimming and on an ice cream run before bed. If he doesn't nap, we usually have to put him to bed right away. I know, exciting stuff, but what can you do? Thank you Kiki for the wonderful Edda name puzzle. It was just waiting for us today in our mailbox. Oh also in the mailbox was a wedding invitation to an old MIT friend. It's going to be in Puerto Rico in April of next year and I'm hoping we can make it! 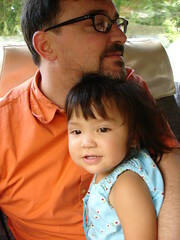 Last long weekend, we went for another long trip. We drove about 1,700 miles altogether and visited 5 National Parks. Mom got her National Park’s passport stamped all over and they filled all the blanks. We went to Dinosaur National Monument in the northwest corner of Colorado and northeast corner of Utah. A lot of Dinosaur bones are still on the quarry wall which is enclosed as a building wall, very interesting. We also walked along the Green River, an upstream of Colorado River. After that, we went to Fruita, Colorado; it is about 30 miles west of Grand Junction, Colorado. We then drove along Grand Mesa near by. We discovered a housing development right along the mountains there. Those houses are huge and with pretty views. 5 acres log itself is about $150,000. They are really nice just like those houses right along side the Scottsbluff Mountain at Scottsbluff, Nebraska. The next day, we went Archers National Park and walked a pretty long distance to see the famous Landscape Arch which appears on many covers of the traveling maps. Its length is more than a football field and the thinnest point is just about 6 feet. Then we drove to a small town just west of Zion National Park which was named by first Mammon settlers about its beauty and its remoteness, and apparently, without religious persecutions. The next day, we went to Zion National Park, Utah. There we saw two climbers on a wall. They stayed there overnight half way before going to the top. It is a pretty sight to see two small dots on this wall of a huge vertical sediment rock formation. After that, we went to Bryce National Park. The oldest tree in the world is there, it is about 5000 years old. In both places, we took park shuttles and it is a very neat idea, less driving by individuals and less pollution to the park environment. After that, we drove north to Capitol Reef National Monument, Utah. It is also very pretty. One segment of route 12 is right on the top of a tall mountain. It was very scary when we drove on top of that because both sides are deep cliffs without anything to block your view, very scary indeed. 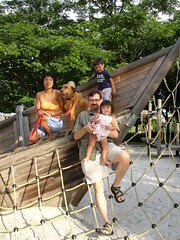 We stayed in a small town at east side of this park. Next day, we drove home and passing by the famous ski town of Vail, Colorado on route 70. Well, this week, we have to work to makeup our 40 hours a week to schedule. It is better this way because our per diem and payment rules. 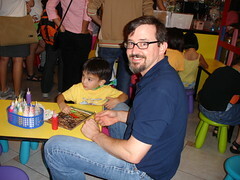 We had a really nice day today - Jeremy turned 37 and we celebrated by going to Jade Garden at the mall. It was a nice dinner, but the kids were wiped out from a long and wonderful day. We spent the afternoon with Kate, the wife of one of Jeremy's coworker. She's from Texas and we met at Julia's party last Friday. Anyways she's a cool pregnant lady, (not in the temperature sense, just in the attitude sense) and we had a nice time hanging at the pool at her apartment complex. Then afterwards, we went to the mall near Kate's house and Vince loves to "craft" which means that he gets to make this plastic window cling. He gets to do this once a week when I have to be out of the house to get it cleaned. Anyways, Jeremy arrived just in time to help out with crafting which took way longer than I thought it would and we were all starving by the time we sat down to dinner. Edda walking yet? Stay tuned. Well. 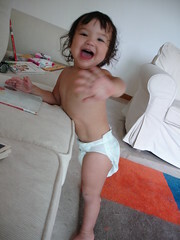 As we all know, Edda is almost 18 months old and not yet walking. She is the speed demon crawler, but no independent steps - almost no interest in walking. She has inherited the flared out feet - a la her mother and will most likely walk like a duck. I'm a little bit concerned, not like OMG concerned, just a little corner of my brain knows that she's a bit behind other kids in the walking department. Anyways, I'm happy to report that just in the past few days, she's been making a lot of progress and seems to really enjoy standing up, clutching a couch. In the morning, when she wakes up, I bring her to our bedroom and then I collapse into our bed hoping to sleep another 15 minutes. She spends the whole time cruising around our bed clutching our bedspread and standing. Woo hoo! 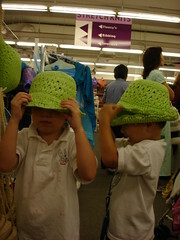 After story time, Vince, Edda and I went to some mall on the island looking for yarn. Vince wants to learn how to knit. Well, we didn't find the yarn store, but we found a sushi place that has the plates of sushi rolling by on a conveyer belt. Went to the Botanical Gardens for a storytime today. We didn't get very far into the gardens, we made it only to the storytime pavilion and then to the cafe as it was rather hot. 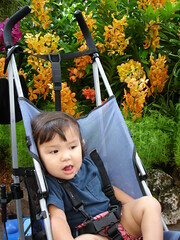 The orchids were lovely as is Edda in front of them. Vince was a little nervous at first, but eventually moved up to the front row to participate in some of the games, Simon Says and I Spy. Our friend Shelia in Austin has been working non-stop during the past few days helping some of the displaced people of New Orleans who have reached all the way to the middle of Texas. She has been working her tail off trying to get money, supplies, donations to the people who need them and also working the phones getting families reunited. Bless her heart! Finished this book by John Irving a few days ago and while I am a fan of Mr. Irving's this was not his best at-bat. I'd go with Son of the Circus anyday, now that was a good book. Tonight we had spare ribs with orange/maple sauce. I thought it wasn't worth the effort, which actually wasn't that much, it just involved marinating the meat in the morning, then starting the cooking 2 hours before you want to eat and finally preparing the glaze. Jeremy thought it was OK though. 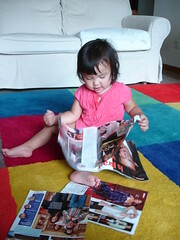 Thanks for the magazines Kiki, originally uploaded by dturnip1. Thank yous go out to my parents for the thoughtful birthday present(s), it will go towards a nice dinner night out on Wed at the Jade Garden. Yummy! Also thank you to Katherine for Animal Baby and the Big Backyard. Edda is still mainly into eating them, but Vince was very excited to see them in the mail. We also got a 2nd package from Paragon with the same ice cream bowls and the book (which Vince loves and we use everyday, by the way). Hmmm. Oh yes, and by the way, if you are totally nuts and want to see a billion pictures of us just click on the caption of the picture, I think it will take you to all the pictures I've ever taken, starting from a month or two ago. The weekend is over again. DSC00078, originally uploaded by dturnip1. Sunday night again, the weekend passes so quickly here in Singapore. I know that it's Labor Day weekend, the traditional weekend for the Lee family reunion, but I guess it isn't happening this weekend, so here's a SHOUT OUT to all those Lees out there, don't work too hard. Today, I actually spent quite a bit of time away from Jeremy and the kids, grocery shopping, walking around the library looking for knitting needles, walking the dog, etc. Jeremy cooked for me and the kids all day today. Spaghetti for lunch and eggs and noodles for dinner. We were suppose to go see a free concert at the racetrack today, but by 7pm we are gearing down and getting ready for bed. Jeremy and Edda in the pool, originally uploaded by dturnip1. Look who is happy in the pool. OK, I'm still trying out this flickr posting and camera thing. But don't my sweeties look so cute and happy? I really miss posting pictures to my blog. What's a blog without pictures, really? Ouch! Edda is a champion biter. Nothing can deter her, I've tried talking to her sternly "NO! ", pinching her chin as she bites so she feels a little pain as she bites my flesh and all sorts of defensive moves. Jeremy managed to get bitten by Jaws yesterday and this is what it looked like today. Doris jumping into the pool. Well, here I am making a fool out of myself by jumping into the pool at our condo complex. Vince had been asking for so long to go to the pool this morning, but we were having a slow, lazy Sunday morning and didn't get around to it until he starting really whining about it. Anyways, we took the new snazzy camera with us and took some action shots and here is one of them. Today I didn't want to get out of bed, which is pretty hard to do with two kids hitting your head wanting breakfast. Edda had a pretty sleepless night last night, I don't know what it is, but lately she has been getting up at weird hours and doing laps around her bed for what seems like hours. I'm just lying in bed with her as she crawls back and forth and back and forth. So since I don't get my sleep, I get grumpy. I didn't want to go anywhere today, even though all week we've been eyeing this COMEX expo. SINGAPORE's Largest computer/digital/internet/cell phone/geekfest. We've been pretty determined to get a new digital camera for a while now. I've used my old one almost everyday since I've gotten it and there are some serious limitations, mainly the extremly short battery life, but I can't tell how much of it is because I don't have a recharger here yet and I also don't have my computer, so I haven't been able to download my pictures from my old camera. Anyways it was always able to take only 30-40 pictures on a single charge and I was forever changing out the batteries. Whatever. So we headed down to Chinatown on the 190 bus line that is right in front of our apartment complex, Vince LOVES the bus. But he HATEs it when he can't sit in the back with the cool kids. We rode the bus all the way downtown and ate at a hawker center. We have this local guide called the MAKANSUTRA which tells us which street food we have to eat at and we've had it for weeks now and we haven't eaten at A SINGLE PLACE listed yet, so today was the day. There are a million stalls in this place and we had gotten a late start in the morning and by the time we got there, it was past kid eating time and they were both fussy and nonplussed by the lack of climate control. We still did not find a the "die, die, must try" stall because, well because Edda was screaming her head off and Vince was drinking only Ribena, this purple drink kind of like grape Kool-Aid but with better marketing. So Jeremy and I ate random meat at random stall and boogied out of there lickity split into an air conditioned mall where the kids calmed down and we bumped into Jeremy's boss from work out for his weekly grocery run. I finally got to go to the yarn store to start my new knitting hobby. Again. It was pretty nice, I got a lot of nice yarn and needles and it looks as if I can just go there and hang out to learn how to knit as long as I buy the supplies there at the store. About 10 women were just hanging out knitting, it was pretty nice. 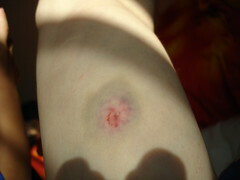 Jeremy and the kids were eating at a dessert place while I was milling about the yarn store, Edda bit Jeremy on the arm so hard that a blood blister formed and now a couple square inches of arm is bruised. Then we headed to Suntec City to COMEX, Singapore's biggest geek-fest ever. We knew we had arrived when we realized that there was shoulder to shoulder max capacity waiting to just get into the mall complex from the subway station. And as we were going up the escalators to the 3rd and 4th floors, the officials were blocking the up escalator because the convention hall was so packed with people, but we finally we got up to the convention floor, which were populated with Nikon, HP, Canon, Fuji, Sony, Samsung, etc, etc, etc, blah, blah, blah. I don't like to shop. But Jeremy bought me a nice Sony camera which I hope to start using soon. We got home at 6:45pm wayyyyy later than I though when we left for the day. 1. Made Crunch-Munchy Honey Cakes per suggestion of the Wiggles. 2. Made chicken-pot pie for the party tonight. 3. Went to the Tristans for a nice party tonight.